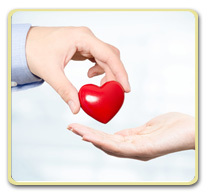 First let’s go over some basic organ donation statistics. Register as a donor – The first step in becoming an organ donor is to register as a donor in your state. You can register online or in person where you get your driver’s license. Registration usually happens many years before donation. When a person comes to the hospital with a condition that will allow organ donation, such as a car accident, severe head trauma, or a brain aneurysm, whether or not they are a registered organ donor is not considered in the health care decisions that are made. Every effort is made to save that patient’s life.